Decades of making exceptional wine have been rewarded with James Halliday’s 2018 Winery of the Year Award! 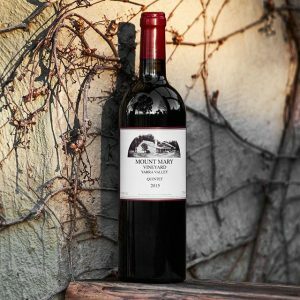 Mount Mary’s Quintet Cabernet blend the hero of their range! Along with Yarra Yering & Yeringberg, Mount Mary is one of the pioneers of the Yarra Valley Renaissance. Their wines have a degree of sophistication, grace, complexity and depth of flavour that is always enticing! Mount Mary is a landmark estate not just of the Yarra Valley but of Australian wine history. In 1971 Dr John Middleton homed in on a site that could grow great wine, and identified a style that suited that site – and that people loved to drink, collect and share. Before turning to winemaking he practiced medicine and worked on occassion with my Dad. In the early days his wines were perhaps less enticing than they are today. It didn’t take long for him to turn things around, and, for decades now Mount Mary has been producing benchmark Australian and world wine. The Middleton family has steadfastly stuck to its regiment of individuality and unimpeachable quality through decades of purposeful, visionary hard work. It’s not right to say the reputation has endured; it has advanced. This isn’t an estate of the past – it’s one of the here and now, and of the future. 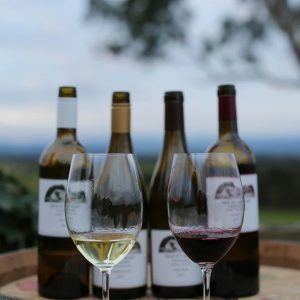 The ongoing work they are investing in developing there vineyards, discovering new clonal and rootstock combinations to combat phylloxera is at the forefront of efforts in the Yarra Valley. There is no doubting 2015 was an absolute belter for the Yarra Valley. Near perfect condition saw stunning wines made across all varieties. Over the last 20 years phylloxera has been spreading through the Yarra Valley. The pesky root aphid kills vines planted on their own roots, not using a rootstock resistant to the bug, no matter how established they are. Mount Mary, like so many others, has not been immune to the pest. You’ll see replanting taking place across the Yarra Valley in the coming years. This will reset the clock, and, those beautiful old vines will be ripped out piled high and burnt in a massive bonfires that will bring a tear to the eye. End result you’ll see average vine age drop and the depth, length, and, sophistication of flavours and tannins reduce. It’s just the way it is. Having spoken to Sam, it’s clear Mount Mary are taking a proactive approach, trialling an array of rootstocks and clones to replace the old vines when they’re ready to make the move. My advice bag some of the old vine gear while you can. Where in the World is Mount Mary? We believe the 2015 Quintet aromas reflect exactly what these Cabernet varieties should from a cool climate region in the very best vintages. Although slightly lower in Cabernet Sauvignon percentage than both the 2013 and 2014 wines, there is still a distinctive, perfectly ripe Cabernet element to the aroma. The flavour profile of this wine is perhaps showing slightly darker fruits than what is typically seen in our Quintet blend on release. Cassis, spice, blackberries and liquorice are all easily detectable along with the more customary aromas of cherries and earth often seen in this blend. The palate is vibrant and concentrated, showing an impressive balance and togetherness already. There’s a densely-packed grip of tannin suggesting this wine will age gracefully in the cellar for many years to come. 'Just because the Mount Mary wines are famed for their purity, elegance and balance doesn't mean that they eschew power and layered complexity. Quintet (the five Bordeaux varieties) is the king of the portfolio, the wine that was closest to founder Dr John Middleton's irascible heart. The vintage may have been especially great for pinot, but the rainbow of cassis, redcurrant, dried herb and bramble flavours are absolutely exemplary. Cork. 13.3% alc. To 2035"
"It’s all just so, and first and last impressions are of a wine of supreme balance, perfect ripeness, and phenomenal length. Red and black fruits, violets, pencil shavings and sweet earthiness. Medium bodied, supple yet gravelly tannin, density and thickness, delivered with no heaviness, cool fresh raspberry acidity, and *that* finish, infused with black tea. It drinks beautifully now, and most likely in another thirty years. A new high-water mark for Mount Mary Quintet, I feel. Tasted: Aug17 Alcohol: 13.3% Drink: 2020 - 2045+"
Gary Walsh, The Wine Front. 2015 was an ideal season for producing quintessential Mount Mary Chardonnay. Philosophically, we strive to make Chardonnay that sits somewhere between the old and new world styles. Firm fresh acid, backed by healthy amounts of flavour, body and character are evident in this wine, attributed from site and season. The aromas of the 2015 Chardonnay open with a slight whiff of struck match before showing an aroma profile ranging from grapefruit and lime right through to white peach, honey, toast, nuts and an array of spices. The palate shows restraint and poise whilst displaying an incredible underlying power and intensity. It’s the purity and length of this wine that sets it apart from other vintages.